Even a small margin of error for a small business can result in high month-to-month costs that mean the difference between success and failure. Surprisingly, in spite of the lost productivity and increased costs associated with manual warehouses, they are still the most common order fulfilment strategy. 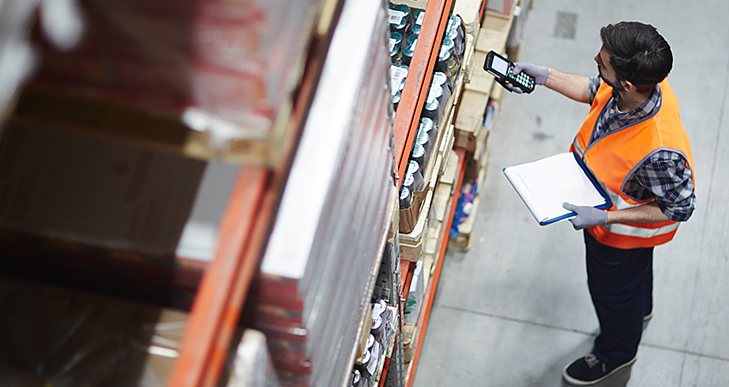 Let's take a look at why the investment in a warehouse management system (WMS), although significant for small businesses, can help you improve your productivity and save you money in the long run. If you’re looking for a stock-standard example of a manual warehouse, it’s not too difficult to pick out certain characteristics that resonate through them, but the most commonly found feature in manual warehouses would definitely have to be that fact that they are generally man-to-goods warehouses. So what is a man-to-goods warehouse? It’s one of the more traditional forms of picking and packing, and is still more common than you may think. Man-to-goods warehouses exist where workers move to a pick location, pick the goods and then physically take it to the delivery dock. Although forklifts and conveyors may be used somewhere in the process, productivity is only as good as the speed the worker picks the goods. Do you have a lot of products organised in random order? Then your productivity is also suffering from workers spending more time looking for the products. 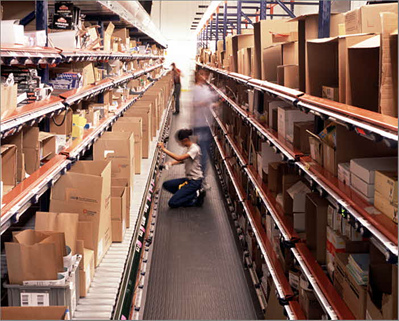 Have you got a large warehouse with a lot of open space? Then you’ll also be losing productivity on the amount of time it takes workers to get from one SKU to the next, and from picking and packing to delivery. Compare this now to what it's like to use a goods-to man strategy. If you look at the differences between a man-to-goods and a goods-to-man warehouse, it's like comparing apples and oranges. The former warehouse relies on a human workforce to pick and pack, whereas the latter relies on automation technologies that seek out the goods on the warehouse floor, and through various set-ups involving conveyor belts or picking robots, the goods are brought automatically to the delivery door. Goods-to-man warehouses can incorporate a range of different infrastructure including high-density storage systems, pallet-based or tote/carton-based systems, horizontal and vertical carousels, robots and vertical lift modules. They also often include the latest and greatest technologies like Kiva (check out our post on the Amazon arms race), and in the last few years, technology in this area so improved so much that automation has improved picking accuracy to nearly 100%. Shifting from a manual to automated warehouse solves many productivity and efficiency woes in a business, but it is also incredibly costly. So now that you understand a bit more about the differences between manual and automated warehouses, let's take a look at the investment decisions you need to make when shifting over. If you’re business is in this phase, there may be a variety of reasons as to why you’re refusing to automate your warehouse, but we’re willing to wager that all your reasons rest on one important thing: the significant costs of investing in automation technologies. Let’s be real for a minute: WMS available for sale are expensive. It can take up to two years for the payback period to start demonstrating cost savings across the business, and if you have extensive materials handling equipment it could take up to five years. So, it’s understandable, it’s a big investment and in the short term it might not be worth it. So right now, your inventory turnover can only ever be as good or as fast as your workers can navigate the warehouse floor. But did you know that if business starts to grow, adding more labour to the process will only create more congestion? If you’re planning on scaling a manual warehouse, it’s incredibly difficult to increase the number of units shipped per hour. Order picking is the most important warehouse process, and letting the efficiency rest on the parametres required to get from one place to the next is a questionable business decision. Take this example: You're designing your warehouse with a manual system of picking orders that is predominately executed by humans. To ensure picking is done as efficiently as possible, you make your aisles very narrow. Once business starts to grow, you need to hire more staff to help with picking. Now you have a congestion issue. The great thing about automation is that it scales well. In goods-to-person you can keep up with demand all while avoiding congestion. Supply chain visibility is a vast and complex topic, so here we will focus on it purely in the context of order picking. Supply chain visibility is incredibly important in peak periods. If your warehouse experiences backlogs and congestion, it may be because you’re not able to look upstream enough to prevent these backlogs. If you don't have the right supply chain visibility, you can't keep track of order fulfilment, suppliers and distributers. Digital processes that create data across your whole supply chain make it easier for you to understand when times of high demand will and won’t occur. This allows you to make better and faster decisions across your whole supply chain. And finally, the bane of many businesses across Australia: mis-picks, mis-packs, and general warehouse errors. Nothing is more frustrating to a small business to incur the costs of a returned, incorrect item that you need to ship back (most likely with express shipping to make sure you keep a happy customer). If you’re struggling to maintain picking accuracy, there may be a multitude of reasons why, but one thing is for sure, automation will help you with your picking and packing woes. Any business with a growing number of SKUs and a manual warehouse would find it hard to manage increasing inventory categories. Goods-to-man systems often include modular components that can cater to a wide range of SKUs while also being flexible enough to be scalable. We hope you enjoyed this post. Have you got a manual warehouse? And if so, are there any benefits we should be aware of? Let us know in the comments below.